The first time you read this card, you don’t realize it’s a Fork variant because of how it’s phrased. It’s really funny to me that they managed to make a Fork variant that’s literally telegraphed. It’s like WWE’s Money in the Bank briefcase cash-in: a big plot device that screams “Hey guys, something huge is about to happen!” And yeah, it takes a lot of mana to get a genuinely huge impact, but that’ll happen now and then in Commander with something like Warp World and be even more hilarious (or frustrating, depending on your point of view). I even think that once or twice it’ll be basically a red version of Duress, drawing out a counterspell because the opponent fears that the next move is a bunch of Lightning Bolts or Overrun variants. Second verse, same as the first. 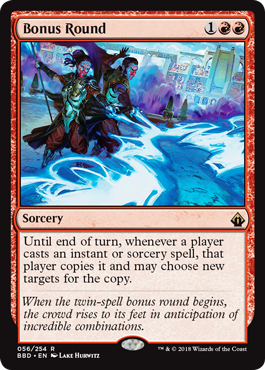 Bonus Round is a spell that kind of reminds me of Past in Flames from Innistrad: you get to do everything a second time. It’s not exactly the same, but it’s close enough! The way Bonus Round is worded makes it a solid play in Two-Headed Giant: you cast it first, then your teammate gets to play demolition derby. It also pairs well outside of that if you have a bunch of mana rituals and the like; were this legal in Modern, I could well see it being a part of the Modern Storm deck. And even as-is, it might be able to make red-based Storm in Legacy slightly more viable. With that said, Bonus Round isn’t all hookers and sunshine, thanks to one bit of wording: every player benefits for the rest of the turn. While you’re obviously going to try and make this an asymmetrical effect, vigilant opponents can turn this around on you when you’re not expecting it. Still, that’s a minor gripe, and Bonus Round can put in a lot of work.